Buster Keaton was one of filmdom’s masterful auteurs , and some of his great silent classics stand as testaments to that fact. One of these, The Navigator (1924), was an early example. 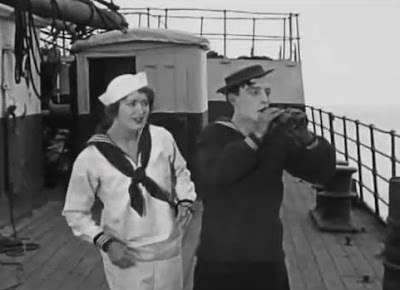 Coming as it did immediately after Keaton’s Sherlock Jr. (1924), which was only a modest success with the critics and at the box office, The Navigator was one of Keaton’s biggest commercial successes. We can attribute part of this success to Keaton’s adherence to his own special scheme of narrative progression, the structure of which I will remind you a little bit more about below. First it is worth mentioning a couple of items about the production. Keaton often liked to give his films an atmospheric setting, the nature of which plays an important role in his cinematic storytelling. Here in the case of The Navigator, Keaton’s production team acquired a 500-foot ocean liner that was about to be condemned for scrap metal, and most of the film is set onboard this ship . And the ship’s environment is so important that in some respects we could say the ship is a key character in the story. With respect to another production matter, we note that although veteran Donald Crisp is officially listed as having co-directed the film with Keaton, the two of them did not get along, and Keaton went ahead and finished most of the film without Crisp’s participation . Here we see Keaton as an earnest but naive young man operating in accordance with what he thinks are the rules in an artificial and quaintly stilted social setting. In these scenes the protagonist must deal with a relentless sequence of unexpected events and obstacles that result in one acrobatic pratfall after another. It is here that Keaton’s amazing agility and athleticism are on full display. And on this occasion, Keaton’s slapstick theatrics are well complemented by those of his costar, Kathryn McGuire. In this phase the world, itself, seems to close in on the protagonist and present a blizzard of unfathomable existential threats. Chaos reigns, as Keaton struggles to survive in an increasingly dizzying world. It is Keaton’s closing maelstrom phase that is his signature and most memorable contribution. The story of The Navigator passes through three phases that roughly correspond to these three narrative dimensions. This whole first phase is basically portrayed in Quaint mode. In the beginning we are introduced to two wealthy and spoiled young people whose lives are disrupted by an obscure rivalry between two overseas countries. When wealthy businessman John O’Brien sells the ocean liner, The Navigator, to one of the two rivalrous countries, agents of the adversarial country immediately make plans to sabotage the ship by setting it adrift from the harbor that night. Meanwhile, the young heir, Rollo Treadway (played by Buster Keaton), to an equally wealthy family’s fortune impetuously decides to arrange to marry O’Brien’s daughter, Betsy (Kathryn McGuire). And he purchases tickets for himself and Betsy to go on an immediate honeymoon the very next day to Hawaii. But when Rollo gets down to actually proposing to Betsy, she curtly turns him down. With his honeymoon ticket already paid for, the now dazed and disconsolate Rollo decides to take the trip to Hawaii by himself, and since he doesn’t like getting up for an early morning departure, he decides to board the ship that night. However, some pier sign confusion leads Rollo to board the wrong ship – not his Hawaii cruise ship, but the about-to-be sabotaged The Navigator. A little bit later and knowing nothing about Treadway’s doings, John O’Brien, accompanied by his daughter Betsy, makes a last-minute evening visit to his just-sold ship. Unfortunately, the foreign saboteurs are now ready to strike, and they capture O’Brien and take him ashore. Hearing her father’s call for help, though, Betsy boards The Navigator to look for him. It is just then the saboteurs disengage the ship from the pier and cast it adrift. The Navigator is now adrift in the Pacific Ocean with just two passengers, Rollo and Betsy. In the second phase of the film, we move into Slapstick mode. We have two spoiled and impractical rich kids alone on a large ship adrift in the sea. Initially they each find evidence that there is someone else on board, and some time is spent on frenetic chase scenes as they search for each other. When they eventually meet up, they then have to figure out what to do. Since they have always been attended to by servants all their lives, neither Rollo nor Betsy has even the faintest knowledge concerning how to cope with practical affairs. In particular, there is a six-minute segment showing their ludicrous attempts to prepare food in the kitchen. Then they see a ship approaching from the distance, and Rollo, hoping to attract the ship’s attention, hoists a flag. However the flag he unwittingly hoists is one signaling that their ship is under quarantine, and the approaching ship quickly sails away. Since they have soaked themselves a few times in the water, they find some drier, sailor clothing to wear, and this occasions our seeing Keaton now decked out in his signature porkpie hat. 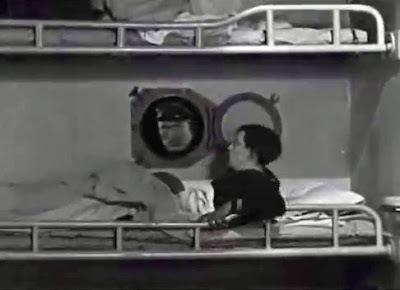 They retire to sleep in separate bedchambers, and there is a funny sequence in which Betsy sees in her own chamber a disturbing picture of a scowling sea captain, which she rids herself of by hanging it outside her port window. But the scary picture hangs down and swings in front of Rollo’s port window, scaring the daylights out of him even more. Eventually they find boxes of firecrackers and Roman candles which they hope to use to signal other ships. But, of course, these get detonated accidentally all at once, causing further mayhem. Time passes, and it seems that Rollo and Betsy have learned somehow to feed themselves on the well-stocked, but still-adrift, ship. They have hooked up some makeshift Rube-Goldberg-like contraptions to help them deal with the large kitchen devices in the ship’s galley. Things seem to be going better. But finally they catch sight of what they have long been looking for – land! This should lead to their salvation, but here it only leads to the Maelstrom. When they look at the land through their spyglass, they see that it is an island full of cannibals. Even worse, as their ship approaches the island, it runs aground and springs a leak. 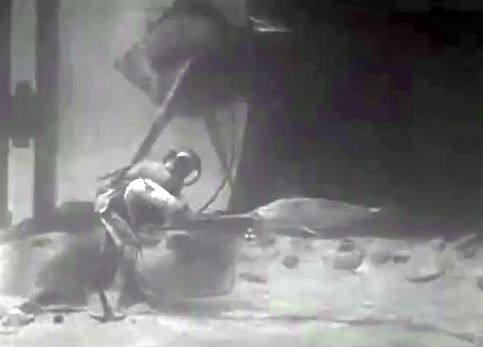 Betsy finds a deep-sea diver’s outfit for Rollo to don, and once he is so clad, she then helps lower him over the side to repair the ship’s hull from the outside. When Rollo enters this aquatic underworld, he finds himself barely able to move (because of his cumbersome diving suit) and having to cope with threatening sea creatures, like octopuses and swordfish. At one point he even has to grab hold of one swordfish and use it as a weapon to engage in a sword fight with another, bigger swordfish. 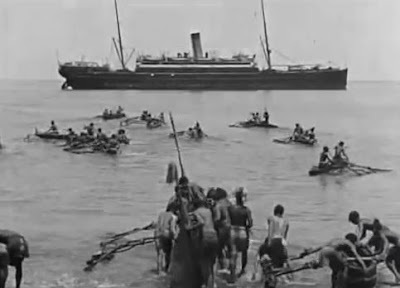 Meanwhile the island cannibals have spotted the grounded The Navigator and have canoed en masse out to it, where they capture Betsy and take her as a prisoner back to their island. Rollo, still at the bottom of the sea, sees that his line to the ship has come loose, but he somehow manages to stagger all the way to the island. When the natives see the strange looking figure emerge from the ocean, they think it is a monster, and they all scatter in fright. Betsy and Rollo then make their way back to the ship, with Betsy sitting on the floating, diving-suited Rollo and rowing as if in a rowboat. But the natives overcome their initial fright and soon chase after them. A chaotic battle ensues, and it seems that the maelstrom only worsens. The natives overwhelm the ship, and Rollo and Betsy try to escape in a lifeboat, but that effort fails, too. They find themselves struggling unaided in the ocean, and all hope seems to be lost. The maelstrom has overwhelmed them. 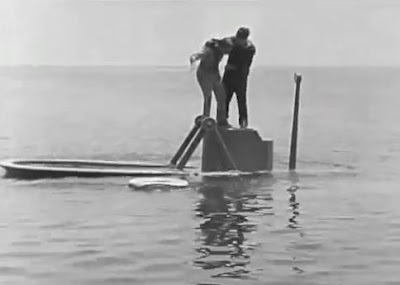 But just as they are about to sink underwater for the last time, they are saved by an out-of-nowhere US navy submarine that lifts them out of the water and rescues them. As is evident from the events described, the title of this film is somewhat ironic. Far from charting and managing a planned course of action, our protagonist struggles to survive a torrent of problems that flood his way. Overall, though, The Navigator stands out as displaying a perfectly crafted Quaint-Slapstick-Maelstrom Keaton narrative sequence. Some critics especially single out the Slapstick part for praise , and perhaps it is due to this section that the film has been hailed as one of America’s all-time funniest films . But I think, as with most of Keaton’s masterpieces, it is, again, the Maelstrom part that renders The Navigator its surreal, existential aura that is so special about Keaton’s best films. Andrew Sarris, The American Cinema: Directors and Directions, 1929-1968, E. P. Dutton & Co. (1968). “The Navigator (1924 film)”, Wikipedia, (15 March 2019). The Film Sufi, “Our Hospitality - Buster Keaton and John G. Blystone (1923)”, The Film Sufi, (26 May 2018). Ed Howard, “The Navigator”, Only the Cinema, (3 April 2012). “America’s Funniest Movies”, American Film Institute, (2002).